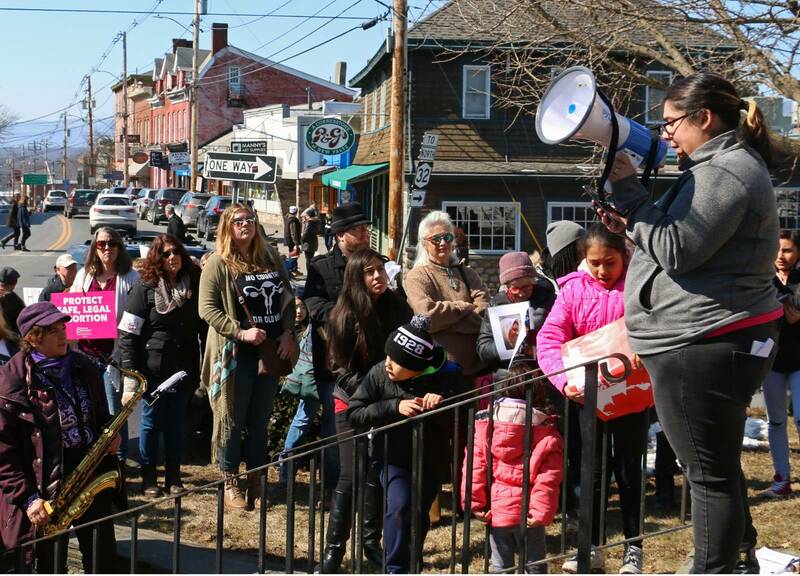 More than 200 activists marched along Main Street in the college town of New Paltz, NY, on Saturday, March 9, to commemorate International Women’s Day. The event, sponsored by the peace group Women in Black, was called to celebrate the achievements won by women over the last 100 years and to remind the crowd of work that remains to be done. More than 20 regional activist groups endorsed the event: Planned Parenthood, the Area Labor Federation, anti-racist and immigrant rights groups, health care advocacy groups, LGBTQ and feminist groups, and representatives of liberal and left political organizations. Organizer and Party for Socialism and Liberation member Donna Goodman introduced the event on the steps of the town’s library. In her remarks, she laid out the issues that define the current women’s movement: reproductive justice, solidarity with people of all gender identities, and fighting violence against women, police attacks on people of color, and the rise of white supremacy. A speaker from the Hudson Valley Area Labor Federation reminded the crowd of the origins of International Women’s Day in the socialist movement and garment workers strikes of the early 20th century. Immigrant rights speakers told of the community’s resistance to ICE efforts to deport undocumented members of the community. A Planned Parenthood speaker promised that clinics would not obey the administration’s gag rule by withholding abortion information from its patients. Young people spoke of intersectional feminism, and a group of high school students stood up for human rights for all oppressed people. The rally was followed by a march through town, led by the activist brass band Tin Horn Uprising, and accompanied by the radical singing group Resisterhood and puppets created by Red Wing Blackbird Theater.